Shoe du jour – the commuter | Footwear Fashionista … a sneak peek into my shoe closet! Never say never. This city girl has moved to the north shore “suburbs”. After 2 days, shin splints from walking in high heels while on the move to/from a train, I had to buy some more practical walking shoes. The hunt was on for a stylish commuting shoe. And although it seemed like slim pickings at first, I found “Codie” from Vionic. 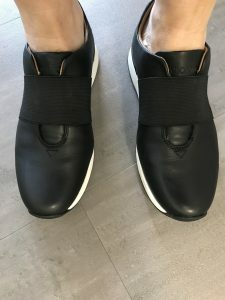 Due to the popularity of athleisure wear, stylish sneakers are still hot, but they aren’t exactly cheap. As for sizing, I had to size down half a size. Most flat shoes have zero arch support, these have an built in arch support, and that cushion is what sold me. 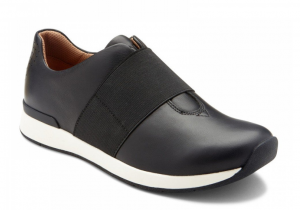 A minimalist, modern, black leather flat with elastic accents and contrasting sole. My feet will be comfortable and stylish until I can get to the office and put on my heels.